This article presents a practical approach to a Graeco-Roman woodworking tool called “ascia-Hobel” in the archaeological literature, respectively “adze-plane” as the corresponding English term. The tool in question consists of an often semi-circular adze-blade attached to a two-handled shaft and seems to be suited both for chopping and for shaving wooden surfaces. It has therefore been considered a possible intermediate between the adze and the proper woodworking plane as known from the Roman era onwards. Archaeological finds of specific forms of adze-blades have convincingly been associated with depictions of the tool. As there are no complete finds of the “adze-plane” a reconstruction based on a combination of elements from the existing sources has been manufactured. In practical use, the reconstructed tool turned out to be a full equivalent to the ordinary adze but with additional features. For comparison, another adze of the same shape and construction was built, but with only a single handle. When used for chopping it worked as well as the two-handled adze even though both tools showed different characteristics. Shaving, respectively carving worked more precisely and effectively with the two-handled adze. Therefore, it could be concluded that the two-handled adze is a specialized kind of combination tool and not an intermediate between an adze and plane. It is functionally rather similar to the adze and obviously not a kind of plane. As it is typologically similar to the adze and, at the same time, lacks several technical and anatomic features of the plane, the writer proposes abandoning the misleading denomination “adze-plane”. Instead, the more suitable term already used in this summary is suggested for further use: “two-handled adze”. As tools of this kind have not been common in recent times, the modern woodworker is not familiar with work steps like smoothing a wood piece with a two-handled adze. This article is based on a poster presented at the EXARC-conference in Leiden, Netherlands in April 2017. It has already been published in German in the EXAR Jahrbuch 2017 but the writer considers an English version necessary to make it available for English speaking colleagues in different countries. The starting point for the practical involvement with the tool that has been called “ascia-Hobel” in the archaeological literature (Gaitzsch, 1980; Matthäus, 1984; 2012) and “adze-plane” in English (Ulrich, 2007) was the question of the origin of the plane. Technical treatises on the historical development of woodworking tools discuss the subject to a certain extent (Norman, 1954; Greber, 1956; Goodman, 1964). As they do not reflect the archaeological record extensively they are not able to give convincing explanations to the question (Schwarz, 2016). 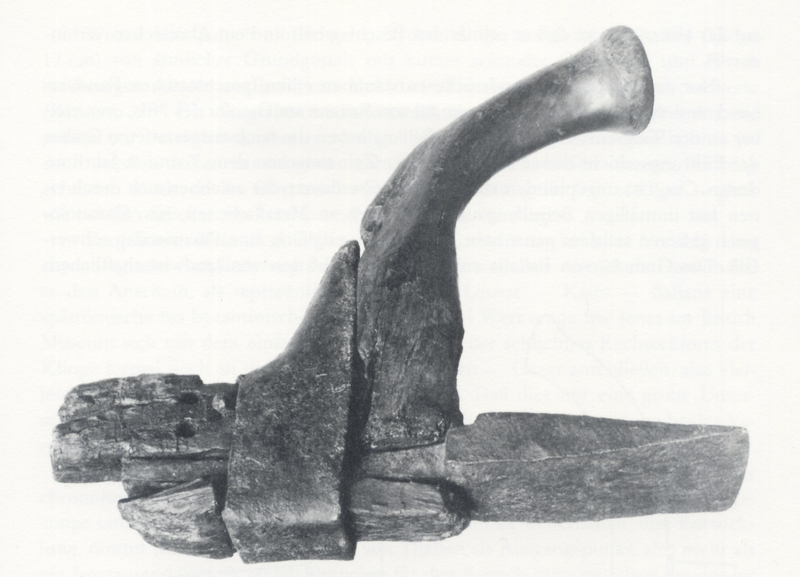 A considered approach regarding the possible predecessors of the woodworking plane can be found in the work of Wolfgang Gaitzsch (1980, pp.108-109), who uses the term “ascia-Hobel” (adze-plane) for a tool with two handles and a flat blade that is depicted on several Roman monuments in the Mediterranean area. This denomination conceptually combines both of the tool’s apparent functions, i.e. the one-handed use as an adze (lat. ascia) for chopping; and moving the tool two-handed on a wooden surface for smoothing, a movement similar to the use of a proper woodworking plane. Therefore, it is in principle, comprehensible to consider the tool in question to be a link between the adze and the plane. Roughly speaking, a possible line of development could be described as follows: the adze, normally used for chopping, occasionally had to be moved directly on the workpiece for specific working steps, the blade placed directly on the wooden surface and the handle pointing away from it. In order to optimize this way of working, a second handle was added to the tool, so working with both hands was possible. This resulted in a more precise and effective removal of wood chips. As a final step, the blade was inserted into a wooden block allowing the cutting edge to move at a consistent angle over the workpiece and to cut chips of a defined thickness. In this development, the plane did not replace the older types of tools entirely but all of them were used simultaneously, with regional peculiarities and different fields of application. Gaitzsch (1980, p.104) considered that direct archaeological finds accounting for the “adze-plane” were actually absent, whereas Matthäus (1984) associated specific types of blades with this type of tool. His argument is based on reliefs on the grave monuments of Roman craftsmen depicting the tool, i.e. 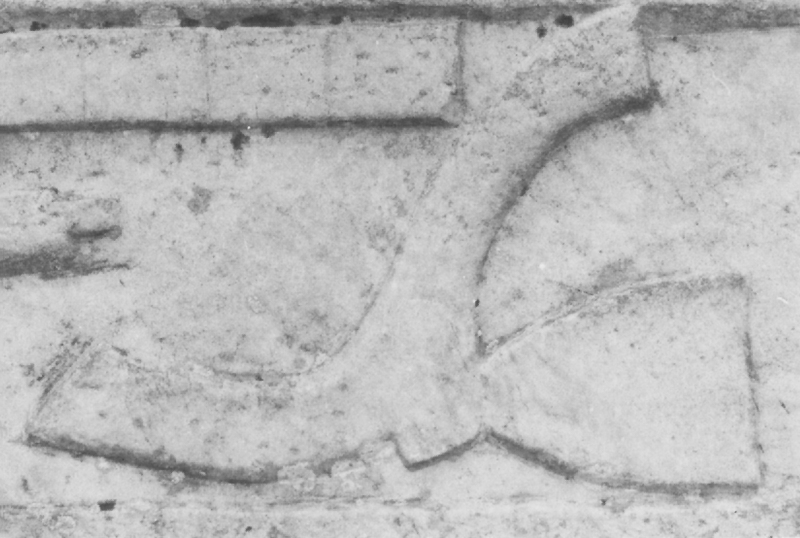 the grave slab of P. Celerius Amandus from Ostia (See Fig. 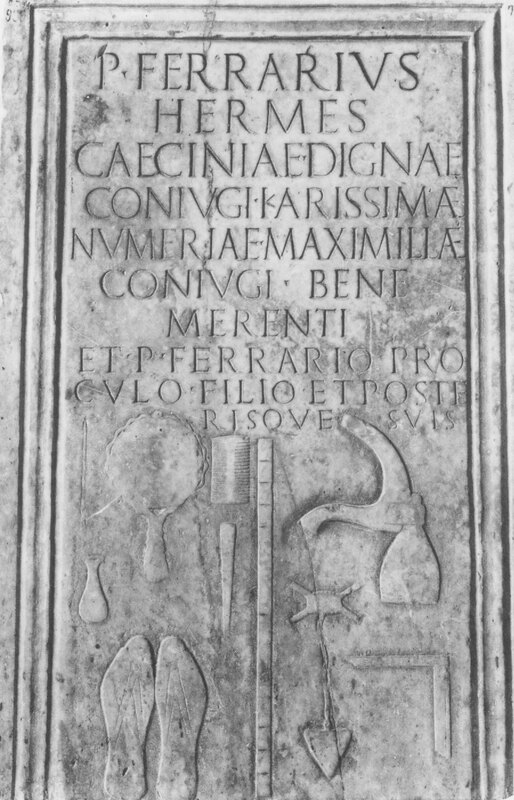 1) and the grave stele of P. Ferrarius Hermes from Pisa (See Fig. 2). In both of these depictions, the blade of the tool is positioned at an angle towards the handle, making an ergonomic use of the tool impossible, so it is probably an intentional distortion of the natural arrangement of the tool. A reasonable explanation for this could be the intention to make the bell-shaped or semicircular form of the blade recognizable, characterising it as a specific kind of tool for certain professions. A naturalistic side view would make it impossible to recognize the shape of the blade. 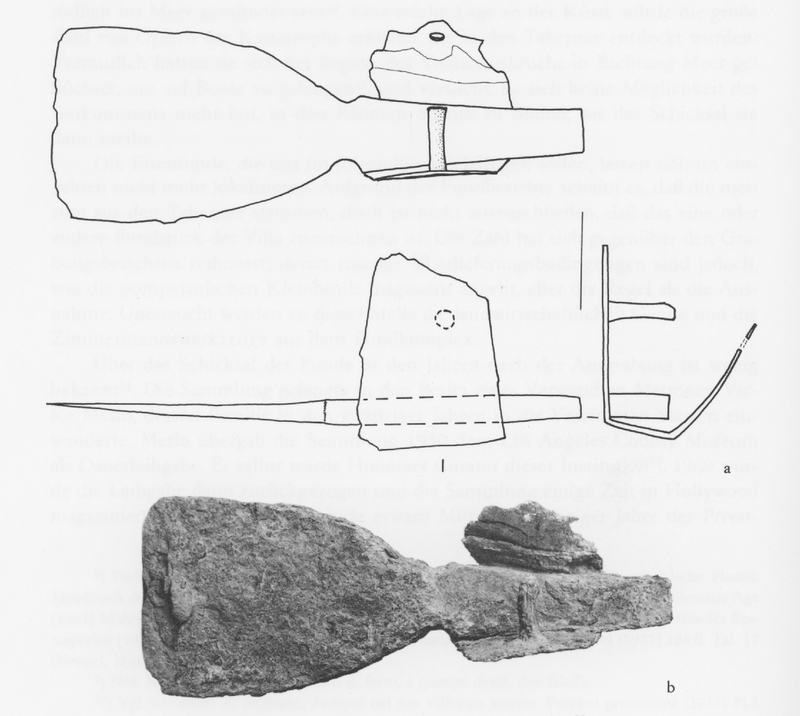 Matthäus (1984, pp.78-79) presents archaeological finds of adze-blades from Pompeii, corresponding very well with the depictions. The assignment of the blades with the type of tool discussed here seems therefore evident. Regarding the terminology, the writer would like to express his opinion already at this point that the tool in question is neither a plane nor an intermediate between adze and plane. Due to this, the tool will furthermore be called “two-handled adze”. The reasons for that will be explained in the following sections. As no complete finds of the two-handled adze have been preserved in the archaeological record, elements from different archaeological contexts that seemed most suitable for practical tests were combined. 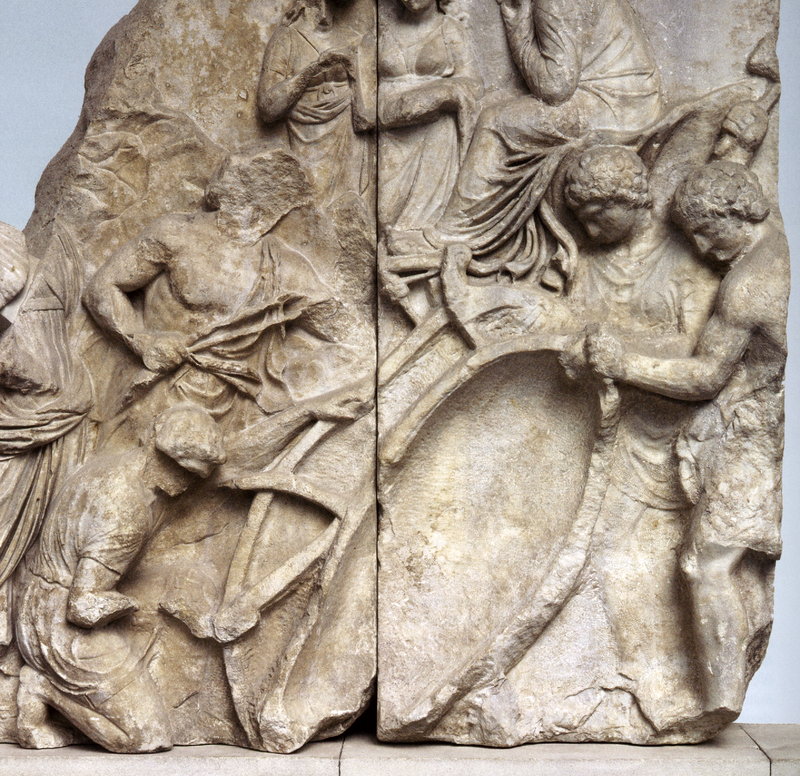 The relief on the Roman imperial period grave stele of Beitenos Hermes from the eastern Mediterranean was used as a template for the construction of the handle. It depicts the two-handled adze in strict side view, showing the two handles, and the blade in an arrangement seemingly well suited for ergonomic work (See Fig. 3). The mounting bracket encloses the entire handle and follows the rounded shape of the handle on the top side. Among the archaeological finds, this construction is exclusively present with ordinary adzes from Egypt, such as the specimen from Abydos (Goodman, 1964, p.42) or another one from a find spot not exactly known, today in the collections of the Louvre (See Fig. 4). The shape of the adze blade on the stele cannot be recognized, it is merely visible that it is continuously becoming thinner towards the cutting edge, whereas the hafting tang is rather large. 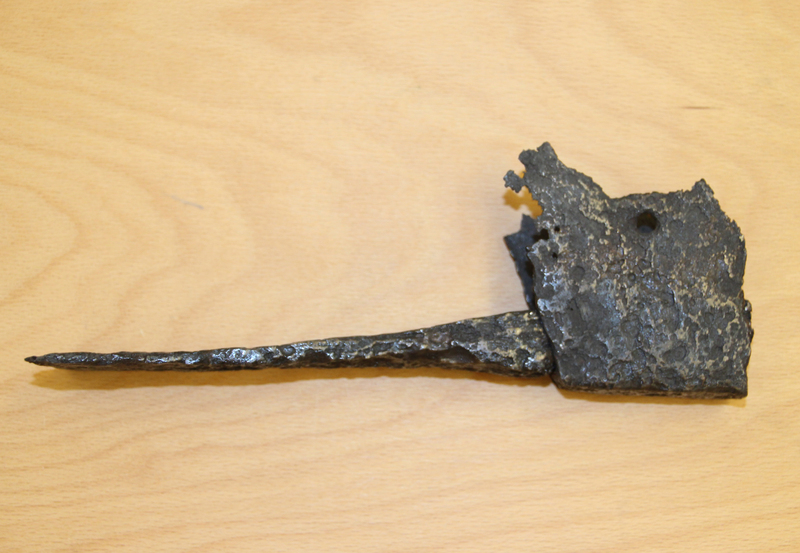 The iron parts for the reconstructed tool were made after a find from Pompeii. It consists of a nearly semi-circular blade with a depression at the sides, separating the blade from the tang, and an accompanying mounting bracket. The bracket was originally fastened to the wooden handle with a cylindrical bolt which is also preserved with the find (See Fig. 5). Similar examples of this type of blade mountings are known among others from Roman adzes in the collections of the Saalburg Museum, one from fort Zugmantel (Pietsch, 1988), and one from fort Saalburg itself (S 3028, Fig. 6), as well as a single mounting bracket of the same type, also from the Saalburg (Pietsch, 1983). Different variants are feasible for the wooden handle construction. A naturally grown piece of wood is a way to produce a handle of adequate durability and strength. A first attempt was made using a branch fork, in this case of cherry wood. It turned out to be rather difficult to find a really suitable workpiece for this task and to shape it exactly like the model, as the tool on the ancient depiction has a specific angle between the two handles and in addition to that each of them is differently curved. So the handle construction was finally made from a 40 mm thick plank of oak, a sort of wood that was very common in Roman material culture for different purposes. Of course, in this sort of construction, the grain necessarily goes across the handle at particular points, resulting in short wood fibers. However, as the handle is very large, with a cross-section of 35 x 28 mm, and despite the fact that it is made of hardwood, there is actually no risk of breakage. The adze blade was forged following the find from Pompeii mentioned above. The general shape and proportions of the replica resemble the original find, but it was not the aim – and in this context not even necessary – to make an exact copy. The measurements are slightly different, and the shape of the replica differs in so far as the sides are not as expansively curved as with the original. The blade is clearly within the range of shapes representing the tool examined here (see Matthäus, 1984, Fig. 11). The metal for the mounting bracket was forged to a thin iron sheet and flanged on both sides, forming a short u-profile channel. Finally, notches were carved in on both sides of the handle so the bracket could be inlayed and riveted to the handle with a simple iron bolt. Before starting to work, the blade was set into the bracket from the front and fastened by itself due to its conical form (See Fig. 7). The aim of the reconstruction was to build a functional prototype of the two-handled adze and, by practically testing it, being able to draw conclusions about the character of the tool and the scope of its application. For this purpose, the tool, first of all, was tested in the manner usual for an adze: shaping a workpiece by chopping off chips from its surface (See Fig. 8). It was immediately clear that the tool was usable as an adze without any limitations. The additional handle was no obstacle at all; it rather seemed to improve the work, as its mass emphasized each strike, thus functioning as a swing weight. The reduced effort needed for each strike made the chopping seemingly easier, so in this respect, the second handle would be an advantage. To check this impression another adze of the same shape and construction was made for comparison, but with only a single handle like a conventional adze. The manufacturing process was the same as before. A handle of oak wood was made, an iron blade with a bracket was forged, a bolt cut to adequate length and all the components mounted (See Fig. 9). This ordinary adze also worked well for chopping, but was less powerful than the heavier two-handled version. At the same time, it was easier to control due to its reduced height. The two-handled construction tends to tilt when the strike is not straight. Thus it requires more precision at work and is in this respect the more demanding and challenging tool of the two. During the tests, a further effect was observed that was obviously detectable only because of the direct comparison of the two variants of the adze: The second handle is also an advantage when lifting the tool after the strike. At a certain point, the weight of the handle pulls the adze backward and supports even the countermovement. The relatively heavy construction with the two handles therefore functions as a swing weight in both directions. When used for chopping in an even striking rhythm, the tool has indeed a distinct pendulum effect. When used for carving or shaving a wooden surface by holding both handles at the same time, the two-handled adze worked very well. It was possible to cut off chips of variable size and the movement of the tool could be controlled relatively easily. An important observation was that the front handle is not needed in full length when using the adze this way, as the most convenient and effective position for the hand in front is on the lower part of the handle (See Fig. 10). This indicates that both ways of working are equally important with the two-handled adze. A pure chopping tool would only need one handle and a pure shaving tool would only need two short handles. Therefore, it can be concluded that the two-handled adze is an explicit combination tool and the two distinct handles are a result of a conscious development. The ordinary single-handled adze also proved to be usable for this kind of work, but as expected it did not work quite as well as its two-handled counterpart. The reason for that is clearly the less favorable way of holding the tool when used in this manner, making the transmission of the power to the workpiece less precise and effective (See Fig 11). As tools of this kind have not been common in recent times, the modern woodworker is not familiar with work steps like smoothing a wood piece with a two-handled adze. Further experiments are required, beyond proving the general functionality of the tools. Desirable experiments would comprise of more complex working processes, testing the two-handled adze in a realistic extension in interaction with other types of tools, ideally within a complete tool kit. Possible examples are going to be mentioned in the following section. Distinct indications of the professionals who used the two-handled adze can be found in the ancient pictorial sources. In several cases, the craftsmen on whose grave monuments the tool is depicted can be identified as specialized woodworkers (Matthäus, 1984, pp.89-95, 98-99). P. Celerius Amundus from Ostia, already mentioned above, was a shipbuilder as well as another man not identifiable by name on a grave stele from Castelvecchio, and a man named Plator from Ravenna, who is designated faber navalis (shipbuilder). Beitenos Hermes was a couchmaker, in today’s understanding a kind of joiner, and P. Ferrarius Hermes from Pisa possibly a carpenter. Being an explicit combination tool the two-handled adze seems to have been adjusted to the requirements of woodworkers who often changed between the two working steps chopping and smoothing respectively carving. The adze blade is moved freely over the wooden surface when the tool is used with both hands so the cut can be adjusted continuously to the form of the workpiece. This is particularly important when it comes to rounded and curved wood structures. So it can be concluded that the two-handled adze was not primarily developed for straight wooden components. In the handcrafts that used the tool, namely in shipbuilding, the processing of rounded and curved wood is part of the daily working practice. In future projects within the field of ancient shipbuilding, the two-handled adze will hopefully be examined in a wider context in order to gain further insights into ancient craftmanship. Additionally another pictorial source should be mentioned in this context, as it might not only show the tool but even the actual work with the two-handled adze. It is the so-called Telephos frieze on the Pergamon altar showing four men working on a small boat (See Fig. 12). Matthäus (2012, p.22) claims to recognize the two-handled adze, with one of the craftsmen depicted. It is apparently used for smoothing a rounded component of the nearly completed boat, while the other three workers are sawing, drilling and chiseling. When iconographic sources of this kind are interpreted with regard to the naturalistic depiction of ordinary features such as everyday life or handcrafts, a certain degree of caution is generally advised. As the frieze represents a mythological scene it shows the boatbuilding only as far as it is necessary for the major context. Hence, a simplified, symbolic depiction of this part of the scene seems appropriate. The working steps are presented only schematically and they are arranged on a limited part of the monument’s surface due to the general composition of the scene. Taking the depicted arrangement literally, the four workers would disturb each other rather than improving the boatbuilding process effectively. Hence it is questionable whether the craftsman with the adze is in a realistic working position. Assumed, this is the case he is apparently pulling the tool over the surface and – to judge from the angle of the blade towards the workpiece – scraping the wood. Chopping with the adze in this position would cut off the wood fibers, which seems hardly adequate in this situation. So the frieze can be considered at most as an indication for the adze being used for scraping wooden surfaces, a way of working that is absolutely common within traditional woodworking. In his analysis of the “ascia-Hobel” Gaitzsch (1980, pp.108-109) argues that the way of using it is principally different from the use of an adze. He sees its primary function in the plane-like two-handed use and considers the consistency between both tools rather in formal, not in functional aspects. Huther (2014, p.42) agrees with this view and claims the tool is more closely related to the plane than to the adze. The results of the practical tests can by no means confirm these assumptions. On the contrary, the two-handled adze is as well suited for chopping as the conventional adze and in this respect functionally similar to it. Even the description of the “ascia-Hobel” as “Werkzeug mit zwei hölzernen Armgriffen, an denen ein Hobeleisen angebracht ist“ (Gaitzsch, 1980, p.108) (“tool with two wooden handles with a plane iron attached to it” [translation by the writer]) has to be questioned. Roman plane irons are usually flat with straight sides and typically have a beveled cutting edge. In contrast, the adze blades discussed in this article have a distinct tang, curved flanks and are thinner towards the cutting edge, without an explicit bevel. These formal criteria divide plane irons principally from adze blades. The blades of the “ascia-Hobel” are consequently not plane irons but adze blades. Also with regard to the anatomic and technical features, the two-handled adze does not meet several criteria that characterize the proper woodworking plane. The main similarity of the two tools is the way of moving it, with both hands more or less flat over the wooden surface. But here even an essential difference occurs immediately: The plane is placed in full length on the workpiece and pushed forward directly on the surface. To enable this procedure, the plane has an entirely flat sole (see Gaitzsch and Matthäus, 1981, p.242). In contrast, the two-handled adze has to be moved over the workpiece at a certain angle, avoiding the handle touching the surface. Otherwise, the mounting bracket would be an obstacle, impeding the forward feed and damaging the wood surface. With the underside placed flat on the workpiece the blade of the two-handled adze would be nearly parallel to the surface, resulting in a cutting angle of only a few degrees, a position rather inadequate for this kind of operation. With the iron fixed in the plane body, the plane has a constant cutting angle. In Roman planes it is usually between 50-65 degrees (Gaitzsch and Matthäus, 1981, pp.238, 243-246). The position of the iron in the centre of the plane body has the effect that the front part of the sole exerts pressure on the workpiece and thereby hinders the wood fibers spliting ahead of the cut. When using cutting tools without this feature there is always a risk that the split that occurs when the blade penetrates the wood will run ahead. This capacity of the wood is being made use of when splitting wood deliberately, but in many processes of woodworking this effect is not desirable. Finally, the defined protrusion of the plane iron above the sole causes a limited thickness of the chips. The two-handled adze shows none of these anatomic features so its operating principle is clearly distinguished from the plane. It is moved freely over the workpiece, making it possible to change the cutting angle and chip thickness continuously. So it is appropriate to characterize its way of working as shaving or carving and not as planing. Intermediate between adze and plane? The practical tests allow a statement on the assumption that the two-handled adze might be an intermediate between the adze and the plane. As described above, the replica first of all is a proper adze, fully applicable for chopping just like a customary single-handled adze. For its second field of application, shaving respectively carving, it is provided with an additional handle, resulting in a different type of construction. This indicates that carving was intended to a greater extent with this tool than with other adzes. Also as argued above, the front handle is not needed in full length for carving because an ergonomic grip is achieved when holding the handle in its lower part. The long front handle combined with the second handle suggests that the two-handled adze is a consciously developed combination tool for specialized fields of woodcrafts. In case of an intermediate tool one can find indications for variants of the tool with two short handles, for example, or comparable forms, but these have not yet been located archaeologically. One important conclusion from the practical tests is therefore, that at this point the two-handled adze cannot contribute substantially to the question about the origin of the plane. An inscription on the grave stele of Aurelios Artemidoros from Macedonia, Matthäus (1984, pp.102-103; 2012, pp.23-24) identifies the ancient Greek term for the tool discussed here as σκέπαρνον (Skeparnon). The Latin equivalent in this context is ascia. In both cases, the depiction of the tool and the text indicates the incompleteness of the grave monument. Here the tool is considered in a symbolic context and within the field of funerary symbolism where these terms may be adequate and sufficient. However, for practical craftsmanship they are not. In the ancient sources the Latin term ascia refers to the conventional adze, the axe, but even to the hoe and masonry tools (Gaitzsch, 1980, p.38; Pietsch, 1983, p.25) and – according to Matthäus – to the two-handled adze as well. With regard to an applicable terminology a denomination is needed that reflects the formal and functional differences between various tools. It is probably impossible to explore the common terms used by the ancient Roman workers in everyday speech, but for today’s reconstructive archaeology a set of terms is necessary, that allow for addressing different tools accurately. As explained, the functional differences between the plane and the two-handled adze are relatively distinct, as well as between plane irons and adze blades. Furthermore, there are formal and functional similarities between the two-handled adze and the conventional adze. Weighing all criteria, the two-handled adze is definitely an adze and not a plane. So consequently a denomination for the tool should be chosen, that corresponds to this fact. As a conclusion the writer proposes to discard the misleading denomination “adze-plane” and plead for a more suitable term. Both functions, chopping and carving, are equally important in the practical work. If – based on the depiction on the Telephos frieze – scraping is also taken into account as an essential working process, one could argue for a multi-purpose adze. However, this criterion is not sufficient, as the conventional adze also is suited for all these duties, although less effective and ergonomic. What distinguishes the tool discussed here most clearly from the simple adze is not the functionality but a formal criterion: the additional handle. According to that, it seems adequate to call the reconstructed tool presented in this article simply a “two-handled adze”. In this context the classification of the tool in the “Kompendium zum römischen Holzbau” (Huther, 2014, p.42) (“compendium of Roman timber building”, translation by the writer) is worth mentioning. There it is listed in the category axes and hatchets and not among the planes, though Huther claims that it is more closely related to the plane than to the adze. Analogous to Gaitzsch he calls it “Dechselhobel” (lit. “adze-plane”), but also cites “Dechsel mit zweiarmigem Holm” (“adze with two-armed haft/handle” [translation by the writer]) as an alternative term. The latter, though a bit awkward, seems to be an adequate designation in view of the arguments cited in this paper. In order to achieve a convention that is objectively correct and at the same time applicable in craftsmanship it seems appropriate to shorten the term to “two-handled adze”. GAITZSCH, W., 1980. Eiserne römische Werkzeuge. BAR International Series 78. Oxford: Oxford University Press. GAITZSCH, W. and MATTHÄUS, H., 1981. Runcinae – römische Hobel. Bonner Jahrbücher, 181, pp.205-247. GOODMAN, W.L., 1964. The History of Woodworking Tools. London: Bell & Sons. GREBER, J.M., 1956. Die Geschichte des Hobels. Zürich: VSSM-Verlag. HUTHER, S., 2014. Der römische Weihebezirk von Osterburken III. Band 2 – Kompendium zum römischen Holzbau. Darmstadt: Konrad Theiss Verlag. MATTHÄUS, H., 1984. Untersuchungen zu Geräte- und Werkzeugformen aus der Umgebung von Pompei. Bericht der Römisch-Germanischen Kommission, 65, pp.73-158. MATTHÄUS, H., 2012. Zur Grabstele des Abdashtar aus Kition. Kypriakai Spoudai 74, pp.15-37. NORMAN, G.A., 1954. Høvelens Historie. De Sandvigske Samlingers Skrifter II. Lillehammer. PIETSCH, M., 1983. Die römischen Eisenwerkzeuge von Saalburg, Feldberg und Zugmantel. Saalburg-Jahrbuch, 39, pp.5-132. PIETSCH, M., 1988. Römische Eisenwerkzeuge vom Zugmantel – Ein Nachtrag. Saalburg-Jahrbuch, 44, pp.28-33. RICHTER, G.M.A., 1966. The furniture of the Greeks, Etruscans and Romans. London: Phaidon Press. SCHWARZ, R., 2016. Vom römischen Handwerk in unsere(r) Zeit. In: A. Lindloff and C.N. Zeitler, eds. Handwerk. Vom Wissen zum Werk. Hanau: Cocon-Verlag. pp.289-311. SCHWARZMAIER, A., SCHOLL, A., and MAISCHBERGER, M. eds., 2012. Die Antikensammlung. Altes Museum, Neues Museum, Pergamonmuseum. 4th ed. Darmstadt: Zabern. ULRICH, R.B., 2007. Roman Woodworking. New Haven, CT: Yale University Press.